Cavedoll was started by lead singer and songwriter Camden Ray Chamberlain around 2000. They have been dishing out dance beats in Salt Lake's music scene and venues ever since. It is the prolific longevity of their career that has Chamberlain, keyboardist Allison Martin and drummer Van Christenson itching for something new. Many albums and shows later, Chamberlain and Christenson have started another band called The Suicycles. While in the same genre, Chamberlain said it “experiments and explores” sounds previously uncharted with Cavedoll. Although both will still continue playing in Cavedoll as well as this new project. Martin is also striking off on her own. She has started a band called My Dead Ego that essentially continues in the same vein as Cavedoll. "It's electro pop-rock," Martin said. "I want to make people dance!" 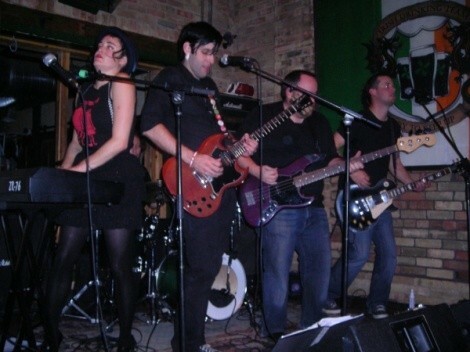 There's no doubt that Cavedoll is a very talented band. They fuse modern dance grooves with vintage synth-pop to create something truly unique and definitely dance worthy. Although it's too early to tell, hopefully The Suicycles and My Dead Ego will turn out something equally as charming and interesting. Either way, locals and fans alike will be waiting in anticipation.